2 chairs in front of the whiteboard, with their backs to the board. rest of students on teams off to the sides. students on each side will determine what order they go in. Each team has an opportunity to start a round, alternating rounds. If either team guesses it on the first try, the other team will stay since they did not have a chance to guess. Add up points and see who wins. Students can create their own Geometric, or Tangram-like, puzzles. A classic tangram has 7 pieces (link), but with this template, students can make their own puzzles with as many pieces as they would like to use. In the sample photos above, I created a puzzle with 12 pieces. 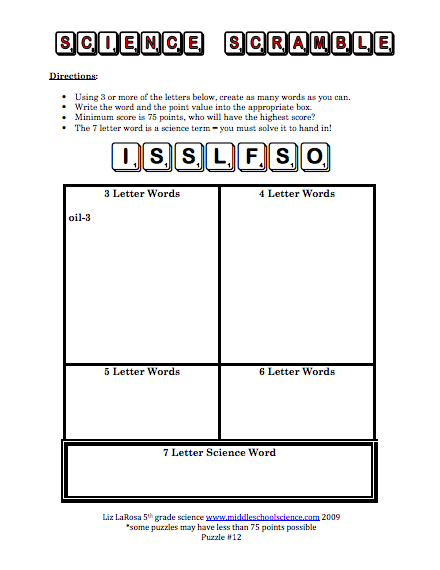 After students have made their puzzles, they can trade puzzles and try to solve them. You can also combine/shuffle 2 puzzles together and try to create one large rectangle, or 4 puzzles together to create one large square. When coloring in the puzzle, darker colors help hide the grid lines. You can also use the patterns each student has created as a cutting template – glue the template onto a piece of construction paper, cut out the pieces, flip, and use the construction paper side as your puzzle pieces. I love “Hidden Pictures” by Highlights magazine. On their website, they release several new puzzles each month and I download and save each one to my google drive so that I can select from different themes throughout the school year. My 6th & 7th grade students really enjoy working on these puzzles and will try to find all the pictures for each one. I hand out one or two picture finds whenever we have assessments (or for holidays) for students to color in with either a highlighter or colored pencils/makers while they wait for everyone to finish their quiz or test. Once their assessments have been collected, they immediately ask each other where the items were that they couldn’t find and spend the alst few minutes of class finishing up the puzzles. There are usually a few items that stump the majority of the kids. Looking for the hidden items helps the students sharpen their observation skills. They are looking for shapes and patterns, looking with a purpose, and evaluating spaces where items could be or can’t be located in. My favorites are the hidden items that are found in the ’empty space’ of the drawings.